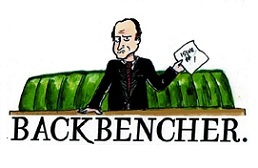 The Backbencher – Who’s culture is it anyway? Stop right there criminal scum!! You’ve violated the law. Pay the court a fine or serve your sentence. Why say you in your defence? (You get an extra 45 points for getting the reference there…and my respect). And what heinous crime have you committed, you might reasonably ask when you are accosted in such a way? GBH? Assault? No, what you have committed is more akin to an Orwellian thought crime really. This is something abominably worse; a post-modern crime for the early 21st century. You’ve appropriated another culture! You may not know that you did it, but the writ of Habeas Corpus doesn’t apply here. You also will not be granted the luxury of a fair trial by a jury of your peers. It will be the mob justice of Twitter, Facebook and Instagram that will be the arbiter in this case. Much like the irate and pitchfork wielding denizens of a hundred adaptations of classic horror literature, they will come in the night, preaching how you’ve hurt ‘muh feelings’ and demand recompense while setting fire to your castle and ostracising you into the frigid and dark night. Or leave you adrift on an iceberg. Whatever. The main issue with accusing people and groups of ‘cultural appropriation’ is that we all do it to a certain degree. Indeed we can’t help but appropriate another culture as we wonder dazed and tired through this journey that we call existence. In this highly globalised era, you’ve appropriated someone’s culture at some point. Ever been in a car? Who made it? Where did the materials come from? Ever eaten a cuisine that wasn’t native to your particular patch of land? Yeah, that’s appropriating another culture. What if it’s ‘fusion cuisine’ such as the Scottish/Italian deep fried pizza? Can you even appropriate a foodstuff? Ever worn a haircut, item of clothing or a piece of Jewellery, that again, wasn’t something produced in the cultural milieu of your nation? If so, you could be stopped by this angry young woman, who stopped a fellow student at an American educational facility for the crime of wearing dreadslocks. Can I wear a pair of moccasins without being a Native American? Is the term ‘American’ appropriation? Can I engage in the Scandinavian phenomenon of Hygeee during the long winter months without being from Scandinavia? The organisation that I work for has a Celtic cross as part of its logo? Are they appropriating Celtic culture? The Celts weren’t even a culture as we know of it, spread across most of Europe as they were, so can their culture even be appropriated? The Chinese have a history of copying their cultural artefacts and sending them to museums. What about appropriating copied culture? Is this still possible? Can copies be appropriated, or does it have to be the original? Can a historical culture that no longer exists be appropriated, like the Mayans or Aztecs? You could go right down to the bone and regard the use of any invention that wasn’t invented by someone from your own culture as appropriation if someone outwith your culture chooses to use it? While watching Black Panther, two of the Actors: Forrest Whitaker and Angela Basset where born in the United States, but they had a generic African accent in the film. Were they appropriating African Culture? Where does it end once we go down this path, where every cultural and even personal act is one of ‘appropriation’? As you can see, these are just a few of the complicated questions that I have considered just from writing this short article, but it illustrates that complexity of this issue once you start to delve down and engage your critical faculties. Recently, these are some of the issues that Twitter user Keziah has encountered by wearing a Chinese inspired kimono dress to her prom. Bear in mind that this is also an eighteen-year-old woman as well. Usually, the SJW twitter mob marshal their reactionary expeditionary forces (Motto: Let outrage reign where none should exist) on behalf of the culture that they perceive to be offended. 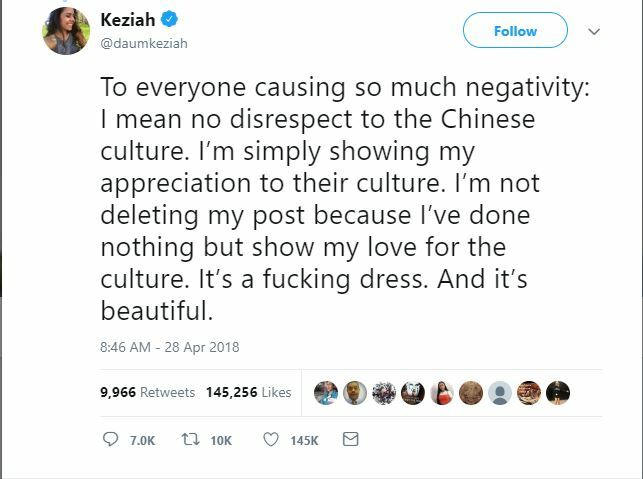 Of course looking through Keziah’s twitter feed actually shows a lot of support for her decision to ‘appropriate’ another culture as long it’s done respectfully, which she certainly did. The people who ought to be offended, at least according to the SJW-left, are flattered by her decision. We also have a lesson to learn from Kezaih as well. She didn’t back down, didn’t make an apology (She didn’t need to, but it’s standard procedure now when someone says ‘I’m offended’). She doubled down and carried on. If only more people, particularly those with a bigger public profile would do the same. Indeed China doesn’t seem to have the same the same ‘PC’ or ‘SJW’ culture as the West, being too busy with industrialisation, making stealth fighters, their fledgling space programme and just generally being the ‘workshop of the world’ to bother with a couple of angry purple haired ladies who are offended on their behalf and are trying to create a nascent issue over a young woman’s choice of dress. As with most of these issues, they tend to offer questions to issues that we never even thought about before. Instead of making the world more interesting, the SJW-left seem to be making it bland in their endless crusade for homogeneity under the guise of ‘diversity’. Only when the world is grey will they truly be happy and unoffended.